YeeHaw Media prides itself on our creative approach to social media management. We are grateful to have honed our skills against the colorful backdrop of the greater New Orleans area. With so many beloved seasonal and annual events, every day presents new opportunity for us to highlight the fun roles our clients play in the local festivities – proving that social media marketing can not only drive customers to our clients and their sponsors, but is also an invaluable community resource for information in their area. Our unparalleled success in this realm is clearly illuminated through our work with downtown New Orleans beloved Halloween parade, Krewe of Boo. Brian Kern – proprietor of New Orleans annual Halloween parade approached the Yee Haw team at the beginning of September to light a fire and really take the events social media presence to the next level. With less than 45 days before the parade, we knew it would be a challenge to get the results we’ve come to expect – but we were ready to give it a go. It was a pleasure to add our touch to the event and work with the Kern Family – who’s knack for producing a killer New Orleans parade is unparalleled in the country. The Krewe of Boo parade takes place the Saturday before Halloween weekend, last year on October 22 but there are many related events in the days before. The brand creates a mini festival in the days surrounding the parade – some exclusive to Krewe Members and some open to the public. Our tasks were vast in this short window. 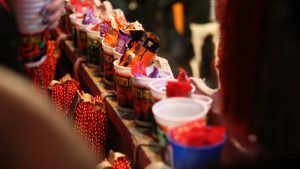 Topping the list was date awareness – as it’s not compulsory to imagine the only major Halloween Parade in New Orleans to occur 9 days before Halloween so date blasting to ALL the Halloween Parade fans in the city was crucial. Blasting and boosting graphic Facebook posts and ads with the date and the route were the perfect kindling to ignite this social media marketing campaign while simultaneously providing the general public and fans of the parade with correct info and a place to ask questions in the comments and get a quick reply. Because we are communicating this message so frequently – it also a great opportunity to show the parade sponsors some love in the graphic posts and get some cross posting traction on their social media platforms. We created a graphic post to highlight the route as a response to questions about the the best place to watch the parade and helping the public to plan their evening in the quarter in advance of the event. This popular, graphic route, date and time posting circulated to reach over 46,000 people with a single post that was informative and representative of every parade sponsor. These are just a few small examples of how Yee Haw took a traditional, informational, event related campaign and added immeasurable value to the client and their sponsors through targeted and effective social media marketing. Yee Haw!